One of the trickiest issues we can face while shooting at Imperial is the representation of personal protective equipment (PPE) in photography. Some people might argue that it’s not an accurate representation of their day to day work having everyone in full PPE at all times, however, we do need to follow the rules and ensure that proper procedures are followed, especially when we are sharing our practices externally. As photographers, we need to ensure that the participants always follow the strongest PPE requirements for their activity during the shoot, as if the health and safety director themselves were present performing an inspection, (as they will quite likely see the resulting image!). 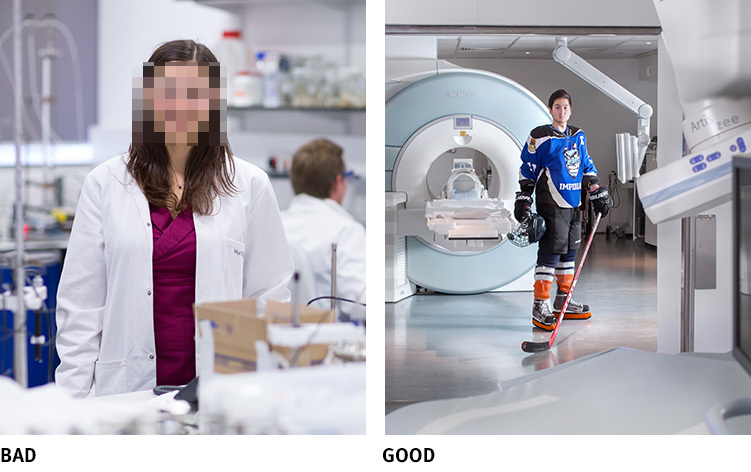 With this in mind, I’ve put together a quick and easy crib sheet to help you make sure that your images don’t get spiked for failing to adhere to the College guidelines on PPE. 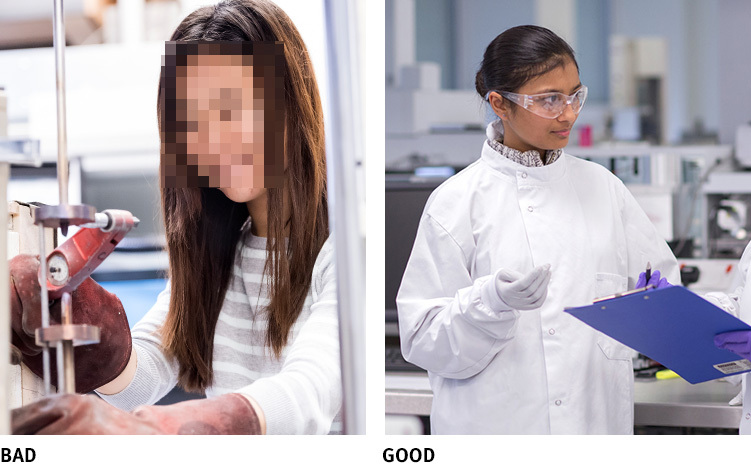 Before beginning a shoot in a laboratory or workshop environment, check the Personal Protective Equipment (PPE) requirements for the space by reviewing the PPE sign on the door and by talking to the researchers and staff in the space. 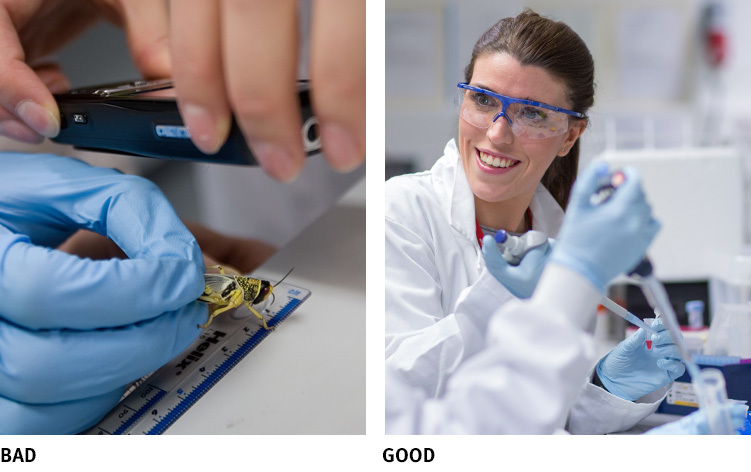 All individuals photographed engaging in research should be wearing the correct PPE required for the space they are in and the activity that they are taking part in. For portrait photography away from the workbench, or laboratories that do not have specific PPE requirements, all photography subjects should still follow general guidelines for safe attire: long hair tied back, protective eye wear where necessary, lanyards tucked into clothing, lab coats buttoned up if worn, sleeves rolled down, and closed-toe shoes. If lab coats are worn, they must be fastened right up to the top button, even for portraits away from the workbench. 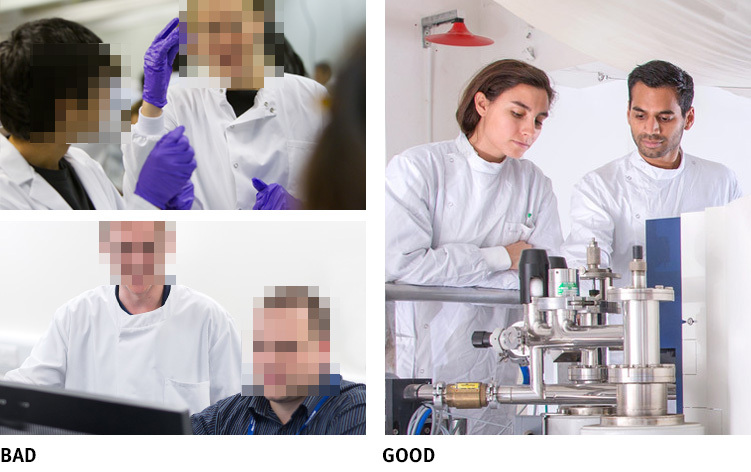 If one person in shot is wearing a lab coat, then everyone must wear lab coat, and they must be done up to the top, even for people featured in the background. 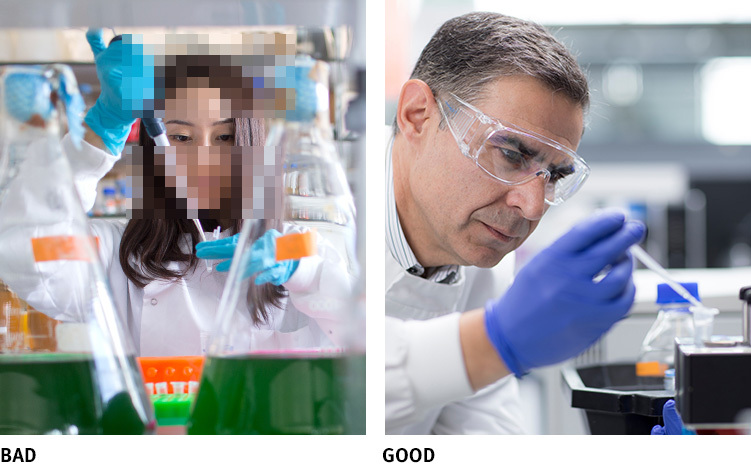 If there is any activity involving liquids, then protective eyewear must be worn in lab photography regardless of the lab, even if the liquid is harmless as the viewer might not know what the liquid is. If one person is wearing protective eyewear in shot, then everyone must wear protective eyewear. 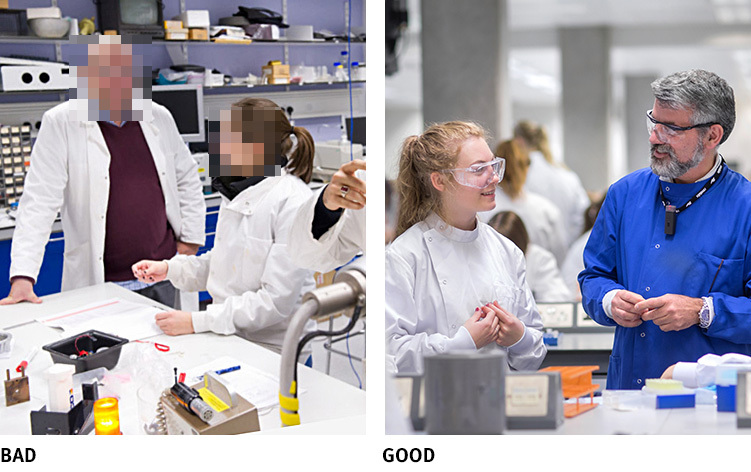 If gloves are necessary, then their use should be consistent in images, and everyone in the shot should be wearing them. Long hair should be tied back and there should be no hanging earrings or jewellery. Lanyards should be removed or tucked into clothing. For portraits the PPE rules can be relaxed. However, there must be no visible activity in the background, everything must be put away and the subject clearly away from the bench. However, lab coats, if worn, must still be fastened up to the top! There are over 180,000 images on the image library, and the majority of these are legacy images from before the recent implementation of PPE guidelines in photography. With that in mind it’s quite possible that you will occasionally find images that breach these guidelines and need to be removed.